I do not get to the movies very often. While I know that there are many great movies out there, I either can’t find the time or justify the cost to see a movie at the movie theater. I also am not one to rent movies much anymore. With the advent of Netflix online, for $8.00 a month, I can fill my time with old movies; or I can watch the many channels that are offered through our cable company. What I am trying to say is that I am going to be writing about a movie that came out in theaters in September of 2011 and was released on DVD more than a year ago. The reason I am writing about this movie now, is that it has had and will continue to have an impact on my family. It caused my small family of four to talk about expectations, about God, about being who God has meant us to be. It caused me to look at what I have been given and to be grateful every day; not just think about being grateful but let those people in my life know I am grateful. It was actually my husband who got our family involved. Volunteers were needed in various capacities for the movie that was to be held at our high school. Kent thought it would be good if the four of us did something to help. Frankly, I was surprised but jumped right in and volunteered our family to be ticket takers. My daughter took time out of her social time with friends to come to the movie, volunteer her time and watch the movie. Even one of her friends joined us for the showing. The gist of the movie is that men need to be involved in the lives of their children. The story is told through the life experiences of five different men. Four of these men are law enforcement officers. The fifth man is a laborer who is having a hard time finding permanent work. Each of them has a different family dynamic. But the common factor is that they all have children. Each is involved (or not involved) in different degrees with their children. A tragic accident causes one of the fathers to look differently at his family and enlists the other four to make him accountable for his actions. It is a very powerful film and I would recommend it to everyone who has a child/children or who wants to have children. Studies show that there is a greater incidence of suicide and violence amongst children who do not have a father involved in their life. A child is more likely to join a gang if there is not that male figure to influence them. During the movie, one of the characters stated that 87% of youth in juvenile detention do not have a father in their life. The actor that spoke afterwards, re-iterated this in his dynamic speech. Even the federal government has studies that show the impact of the father in the raising of children. He is not just a second adult in the household. He counts and does have influence. http://www.childwelfare.gov/pubs/usermanuals/fatherhood/chaptertwo.cfm A father can show his son how to respect a young lady by the relationship he has with their mother. A father can show a child how to work hard and how to be a good influence. My children are lucky. They have a mother and father in their life. They have a mother and father who love each other. They have a mother and father who have taken on the responsibility of being a parent and guiding them in a way that teaches consequences, commitment, consideration and yes, courage. The movie made me cry more than once. It made me proud of my family. I was certainly proud of the family that felt compelled to bring this movie, and everything that went with the movie, to our community. On a beautiful, warm, Saturday, over 250 people took time out of their day to experience “Courageous”. After the movie, we were invited to join the family that organized the event, some of their family and friends, our pastor and Robert Amaya for dinner. Robert played Javier Martinez in the movie. He was the man struggling to find work to provide for his family when he was befriended by Adam (main character) purely by accident. http://premierespeakers.com/christian/robert_amaya. Robert is a very powerful speaker and was a perfect fit for this movie. Kent, my husband, was lucky enough to sit by Robert at the dinner table and they had a wonderful conversation. Kent learned that Robert tries to live his life as a man of courage. It was very evident in his speech after the movie. He quoted the Bible a lot in showing that God has a plan for fathers, a plan for men in this world. Part of the plan is to work hard. God called Adam to work in the garden (Genesis 2:37). Work is not a sin or punishment. It is what man is to do. A man is also to be a father and teach his children the ways of God. I think Kent was inspired to continue his duty as a father to our two children and teach them Godly Ways. I know that there are a lot of single parent households out there. I know that there are children out there that do not seem to have love. I wish that every father, and every mother, could see this movie and really hear the message that it is trying to deliver. We wonder how to make our world a better place? We do so by being better parents, by being a better spouse. We do so by taking our responsibilities seriously and thinking through the consequences of our actions. I know that I am a better person because of this movie. I know that I am inspired by Robert Amaya. Even though I am a woman, I know that I can be more supportive of my husband as the father of my children. I know that I do not always honor him the way I should. By me being a better wife, he can be a better father. I thank God for Robert Amaya, Sherwood Pictures for bringing this story to the big screen and the Kendrick brother’s, Stephen and Alex, for writing this inspiring story. Sherwood Pictures and the Kendrick brother’s have written and made other inspiring movies. They are “Facing the Giants“, “Fireproof” and “FlyWheel“. While I have not seen their other movies, I do believe that they are on my “to watch” list. 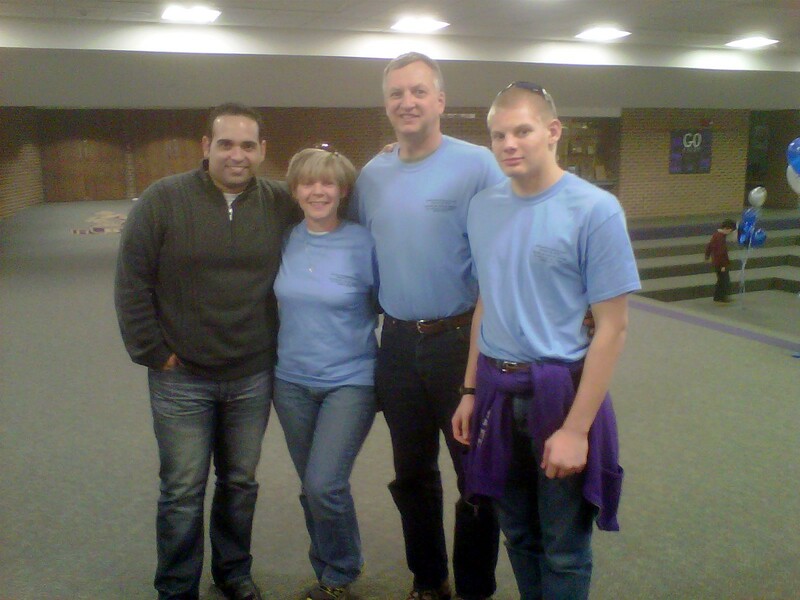 Robert Amaya, from the movie “Courageous” with me, my husband and son. Please find time to see this movie if you have not already. I hope that you too, are inspired to be a better parent, a better partner to the one you love. May God Bless and give you the COURAGE, to be the best you can be to Honor Him!